PAINTINGS GALLERY – JEWELRY – SHAWLS – FURNITURE – MANTILLAS – PRINTS – CURIOSITIES. ETC. 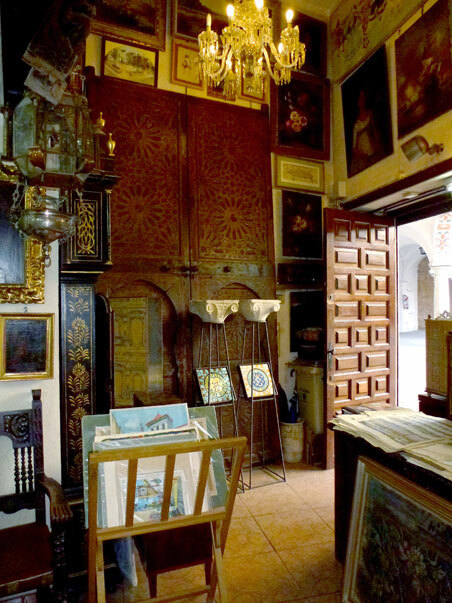 The history of antiques Lola Ortega dates back to the 1920s, when our grandfather Manuel Ortega opened an antique shop in Cruz Verde street in Seville to manufacture and sell lanterns. During the 1929 Ibero-American Exposition of Seville, the shop made lanterns for several buildings and pavilions, including the Alfonso XIII hotel. After the civil war, Manuel Ortega focused all his efforts on growing the antiques business and preparing for a world that he sensed would soon be very different. During the postwar years his daughter, (our mother) Lola Ortega, acquired excellent training, a rarity for a woman of her time. She majored in languages, including English, French, and german. Her education did not end there, as she was avid reader up to end of her life. After a few years, the Verde Cruz Street shop moved to Number 5 old Jose Antonio street (new constitucion avenue) and took the name Ortega Antiquities. When Manuel Ortega died, his widow Lola Mellado took over the store, continued to raise their three children Manuel, Lola, and Julio, and worked to build the business. Our mother Lola Ortega remained there until 1975 when the family business became independent and took a place in the nearby spectacular Plaza del Cabildo, where she moved whith our father Antonio Morales Gallardo. They both worked there and frequently traveled throughout Spain and France. After the death of our parents, we siblings continued to manage the family business and continue to strive to maintain the same line of antiques that our ancestors had, while adapting to changing times. It is essential for us that the customer is satisfied and trusts us. We spend most of our time finding, purchasing, and rescuing from oblivion and neglect, paintings and objects that we then care for and restore if necessary. Not surprisingly, we learned from our parents that one of the greatest satisfactions is that the client trust us and is fully satisfied in every transaction.